* User-Friendly Interface - It simply couldn't get any easier to navigate through our software! No need to be stuck on one step as many software cause you to. All of the steps are outlined and accessible at the tope of all windows! Jump around as you wish -- it's much easier that way. 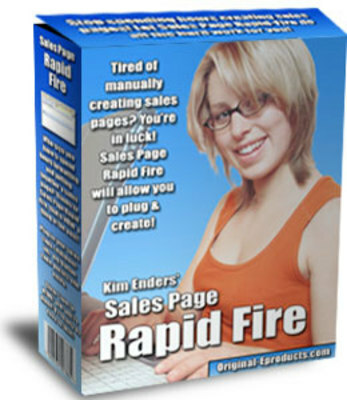 * Professional-quality output - This sales page was created with Sales Page Rapid Fire. By using SP Rapid Fire, you too could be making professional sales pages just like this one with minimal effort! * Ability To Preview Your Sales Pages - Asimple but valuable feature of SP Rapid Fire, you can preview your sales page as many times as you wish while you're creating it. Gone are the days of having to start all over if you botched up just once! * 3 Customizable Sales Page Templates Built In! - 3 Template Options -- They're all you'll ever need to make great sales pages every time! * Save Option - You can save any sales page you work on (at any point) by clicking just one button! * Ability to easily include your graphics - No need to hard-code graphics into your salespage. Just browse and find your picture file. Click one button and SP Rapid Fire will automatically insert it for you! Order Now & Save Money By Taking Advantage of My Special Promotional Offer!